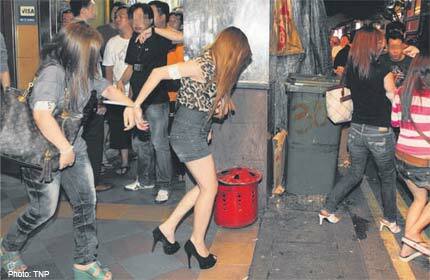 SINGAPORE – A joint overnight operation in Geylang has resulted in the arrests of 56 people for various offences. The anti-crime blitz, which ended on Friday, was led by Bedok Police Division and involved enforcement officers from the Immigration & Checkpoints Authority, Central Narcotics Bureau and Health Sciences Authority. The suspects were made up of 21 men and 35 women, aged between 18 and 73. Their array of alleged crimes included vice and drug-related offences, immigration offences and the peddling of illegal sexual enhancement products. Geylang is notorious for being the `anything-can-do’ town of Singapore where illegal activities are conducted in broad daylight. “This is what we would like to see of more from the Police,” said Kamal Hussein, 56, a technician.